Once again, thanks to all of those who read Disaffected Musings yesterday generating another daily record for views and visitors. Do you think I should keep reporting these or only in the case of a really exceptional number? Another sign has joined the group as a DeSoto/Plymouth service sign is now on the wall. I have discussed my obsession with DeSoto, but have not discussed Plymouth very much. Both makes were introduced in the summer of 1928 by Chrysler Corporation as 1929 model year cars. Obviously, both cars survived the Great Depression. From hotrod.com a picture of a 1968 Plymouth Road Runner. 1968 was the first year the model was offered. It was supposed to fill a niche for a muscle car that wasn’t too expensive. The lowest base price for a 1968 Road Runner, which was for the non-hardtop two-door coupe, was about $2,900. The base engine for the Road Runner was the Mopar 383 cubic-inch V-8 with a four-barrel carburetor rated at 335 HP/425 LB-FT of torque. Of course, the car featured cartoon emblems of the Road Runner as well as the “Beep Beep” horns. 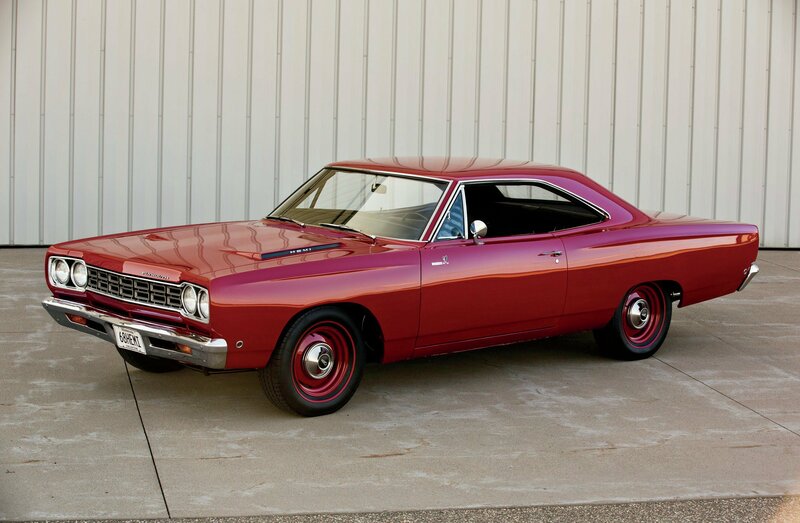 From moparblog.com a picture of a 1967 Plymouth GTX. 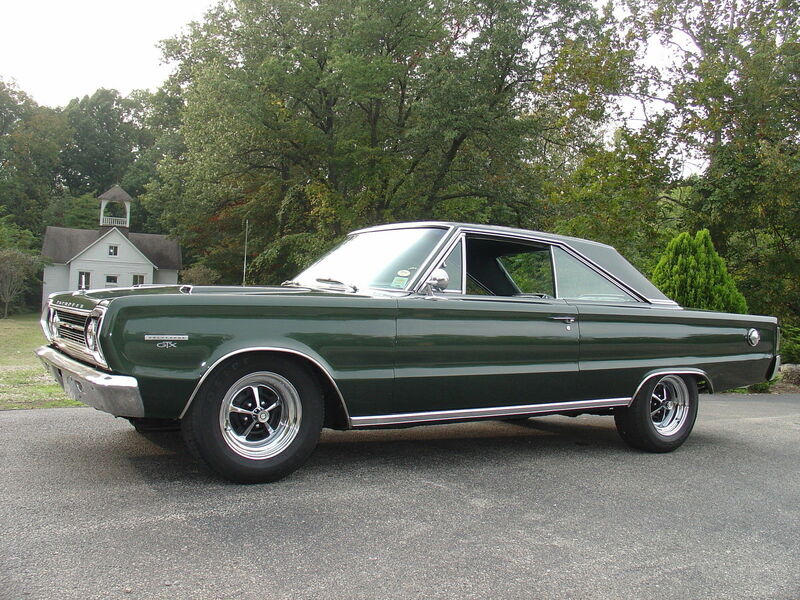 I believe this is the only year the GTX had this look as for 1968 the entire Plymouth Belvedere line was restyled. The base engine for the GTX was the 440 cubic-inch V-8 with a four-barrel carburetor rated at 375 HP/480 LB-FT of torque. So that the comparison is apples to apples, the lowest base price for a 1968 GTX was about $3,300 or about $400 more than a Road Runner. In yet another example of the folly of human beings trying to predict the future, high-performance cars weren’t gone forever after 1971 as almost everyone predicted at the time. I think that each member of Detroit’s Big Three currently offers a car with at least 700 HP and these cars are comfortable, handle and brake well and are reliable. While most seem to think the days of the internal combustion engine are numbered, who really knows what the future holds? Per my usual Facebook commenting: Not enough signs. I don’t have room for more signs on that part of the wall. and good luck finding a decent copy of either of those Mopars for less than 6 figures today! Not the run of the mill collectibles, the “special” cars. Most old Mopars either rotted away in harsh winters or were so butchered by owners prime examples fetch eye-raising numbers. For me, I love me a B or E body! have, pistol grip, 440 magnum (although the 383 never got its fair due to be honest and is quite healthy in its own right) and 8 3/4 dana rear and you have one near bullet-proof potent combo! Great point, Steve. The old saying is that hindsight is 20-20. I think hindsight has X-Ray vision. Who knew what these cars would be worth? I am a huge fan of the looks of the second generation Charger, especially the ’68 (I like the pristine grille). Yes, that car has almost become a cliche, but man it’s a pretty car. Lighten it a little above the center of gravity (replace the hood and trunk lid) and put modern suspension on it…that’s my restomod obsession talking. What can I say? I am who I am. Hey, you don’t think an LS9 is overkill for my restomod, do you? As they say, there’s no excuse for cubic inches! LOL…but sounds like you have unlimited funds available….if so, go for the biggest and baddest thing you can get. Problem is, what you build may not appeal to the next person so resale is or may not be an issue. As someone else mentioned, getting the ting to hook-up is the biggest issue. Again going to suggest the Art Morrison chassis or else you will need to retrofit the existing chassis for cornering prowess as well as HP handling. If you go with an LS9 then you need to back it up with a trans and ECUs and wiring and all…it gets very expensive. Are you planning on a $125K-200K build? Steve, thanks for the advice. I don’t have “unlimited” funds, but I know the build will not be cheap. I am reluctant to actually write down what I expect to spend because I don’t know who’s reading this. I don’t really think I will go with an LS9 or LT4 as the LS376/525 can be tweaked via intake and exhaust to squeeze out another 20-30 HP and get me to the 550-ish HP that will work just fine. I am glad to hear that if I somehow have the funds, which I don’t expect, a supercharger would not be hard to live with on a daily basis. The company that is 99% likely to get the project has been in business for 30 years. They almost have the restomod builds down by rote. They have a custom chassis built that will facilitate C6 or C7 suspension and brakes under a C2 body. As always, I welcome your expert advice.